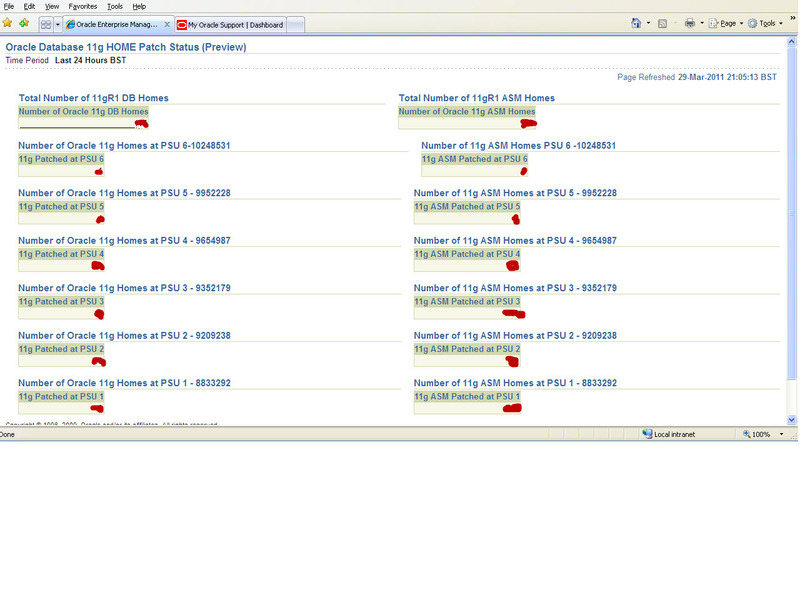 The code for each piece of the report is shown below. 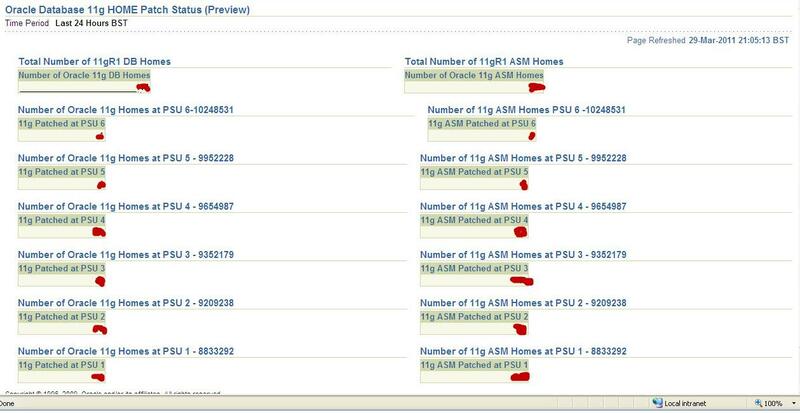 SQL to show the number of rdbms homes, the number of ASM homes and how many homes have PSU 4 applied. Note that I am only interested in the 11GR1 databases on this report as we run a seperate one for 10g databases and we only have a few 11GR2 databases at the moment. 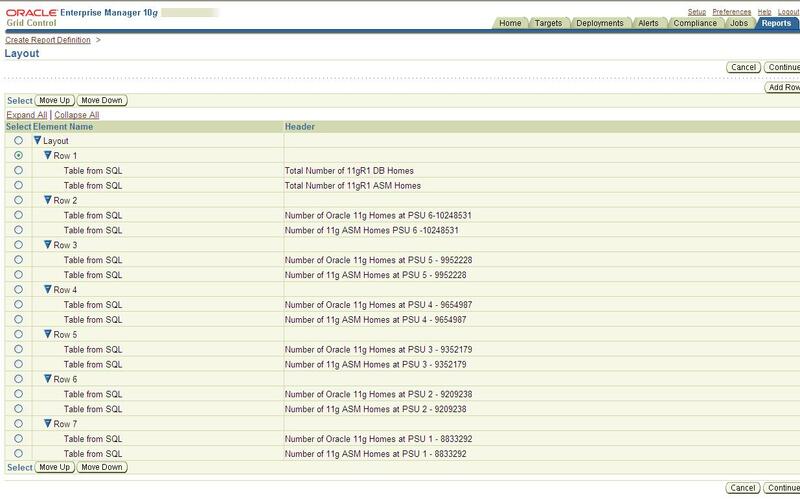 select count(*) "Number of Oracle 11g DB Homes"
select count(home_host) "Number of Oracle 11g ASM Homes"
The way that the patches for a PSU on both ASM and rdbms are laid out side by side is from the layout tab of the general page of the report. Finally the report is scheduled to run on a fortnightly basis and save copies. 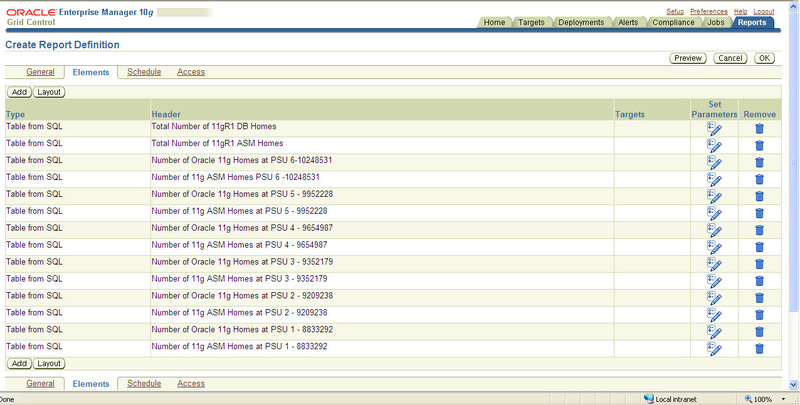 This is from the schedule tab and the key thing is to tick the ‘Save copies of report’ box. I hope that this note has been helpful and I am always happy to see how others are using the OEM reporting capabilities. This entry was posted on March 30, 2011 at 8:28 am	and is filed under Grid control and agents, Oracle. Tagged: database estate, Enterprise manager report' Grid report, OEM reporting, patches, PSU. You can follow any responses to this entry through the RSS 2.0 feed. You can leave a response, or trackback from your own site. Very Nice – thanks for sharing ! Nice Report. However, this would require updating each quarter when the PSUs are released. I am having a running battle in an Oracel SR now, trying to convince them that it is bad practice to have the database version ( select version from v$instance) showing as x.x.x.0 when Psu patches have been applied.